I’m not much of a shopper on my home territory, but love shopping in India, especially Delhi, which is well supplied with everything from roadside stalls to glitzy shopping malls, plus a good selection of handicrafts from all over India. 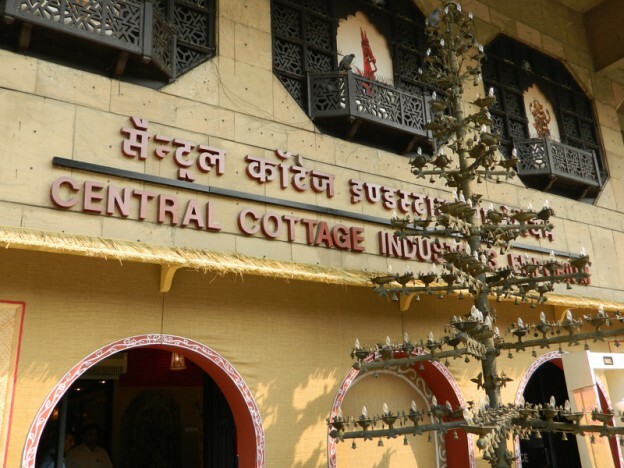 The oldest and largest place to buy handicrafts (probably in all of India) is the Central Cottage Industries Emporium on Jan Path. It was there when I was in high school in the 1970s and 80s – already seeming to have been in existence for decades – and hasn’t changed much since. 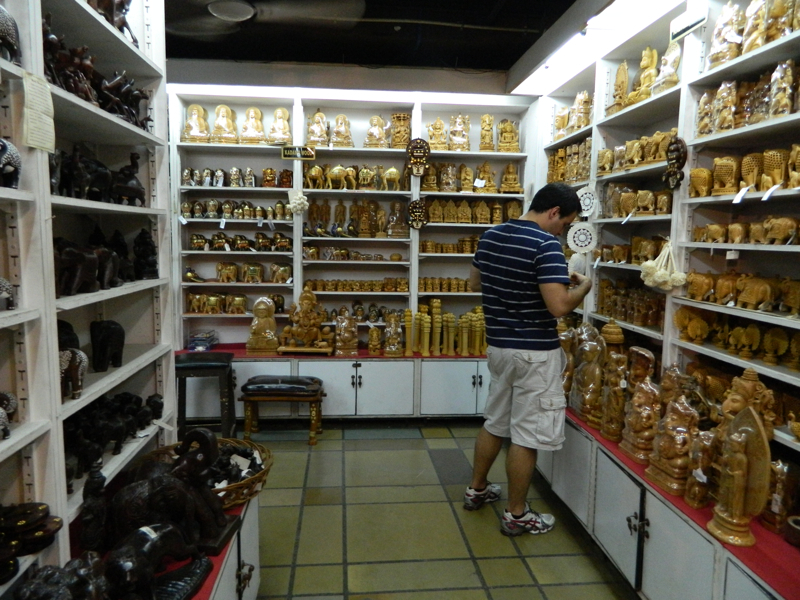 Many of the goods here are items that have been sold to tourists in India for decades, if not centuries. 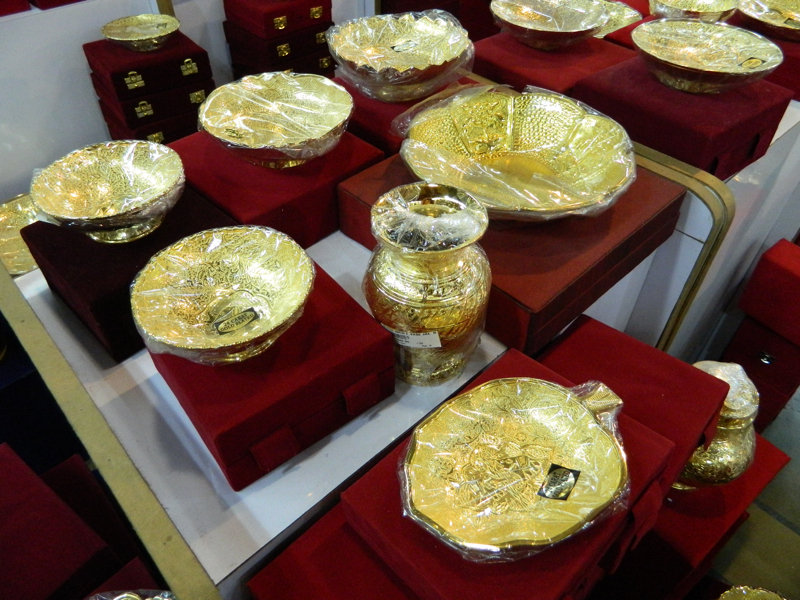 There are innovative twists on handicraft tradition available in India nowadays, but you won’t find them here. 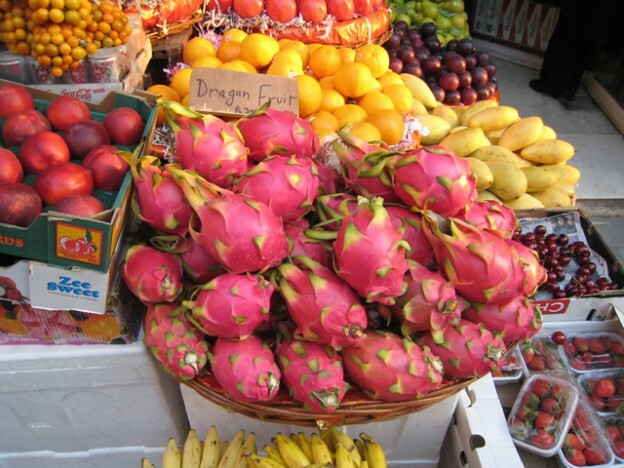 However, for the usual stuff, you’ll get a large selection, decent quality, fair prices, and no shopkeeper at your elbow, constantly urging you to buy. ^ Gold-plated dishes as tourist tat was actually new to me, I can only guess that it’s aimed at the Middle Eastern market. CCIE has a nice, though relatively limited, supply of textiles – silk, cotton, wool; printed, dyed, batik, embroidered; for clothing, curtains, and upholstery. If you love fabric (I do! 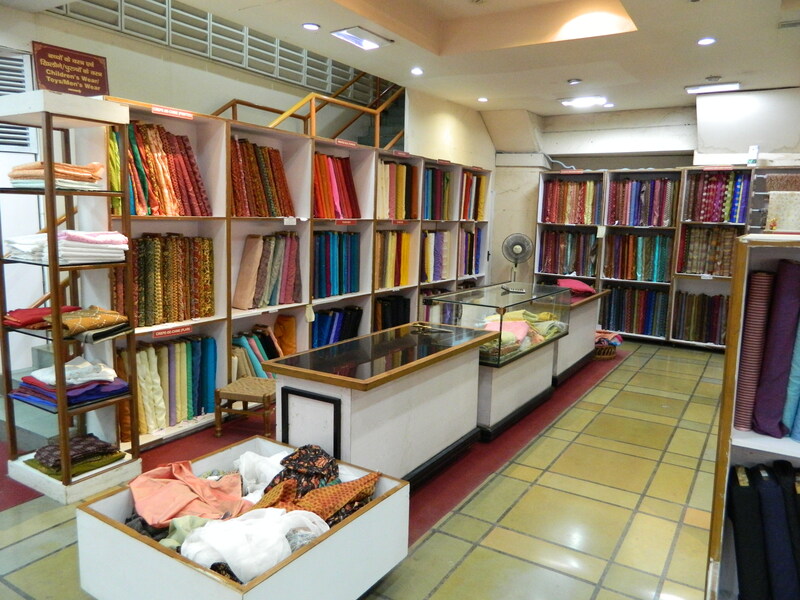 ), this is a good introduction to the breadth of traditional cloth available in India. 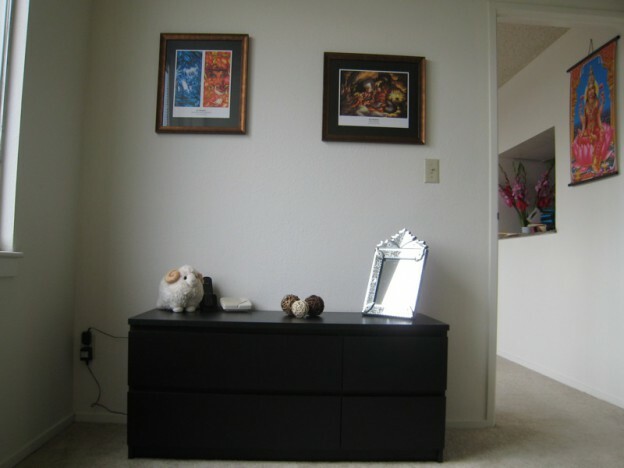 Note the remnants bin – great for finding decorative pieces suitable for framing. More in the photos below, and there was much more that we didn’t photograph – books, clothing, toys, tea, perfume, jewelry, bedding, cushion covers, furniture, even architectural pieces like carved doorways and columns. (I assume they will ship that sort of thing, no idea what it would cost.) There’s also a cool, quiet coffee shop on the top floor. Actually buying anything is a bit of a process. In each section of the store, hand over your selections to the waiting personnel – that they merely wait, and don’t hassle you, is a huge improvement on every other tourist shop in Delhi! 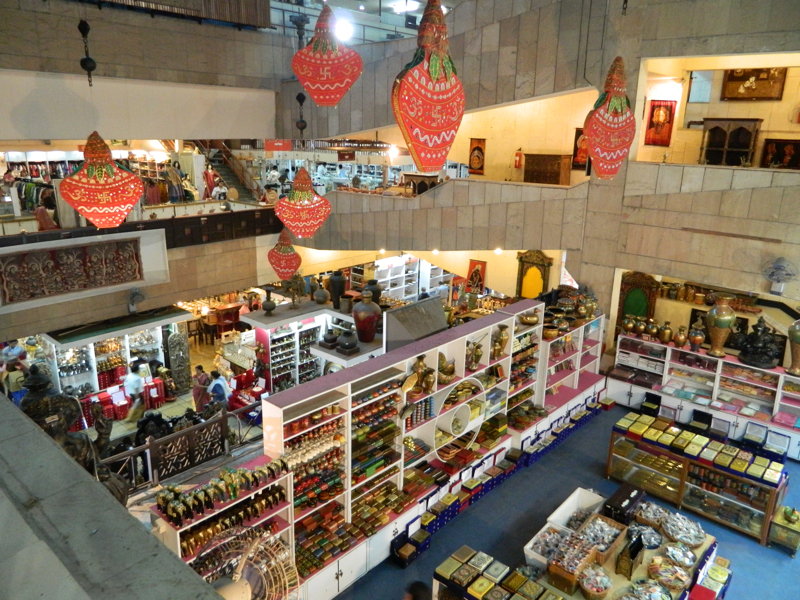 The staff write you a receipt, your goods are whisked away, and you continue shopping. This is dangerous – you end up carrying a handful of paper, with no clear idea of how much you’re acquiring. When you’re finally finished, you take your receipts downstairs to the “cash desk”, and pay for everything at once via cash or credit card. Each of your receipts is firmly thwacked with a “paid” stamp, and the whole pile given back to you. You trot over to the nearby pickup counter, and are handed a dozen or more recycled-paper bags in various sizes, one for each section of the store you bought from. It is permissible to consolidate these into fewer bags for easier carrying. Then you’re done, and step back into the heat and roar of Jan Path. This entry was posted in travel in India and tagged shopping in Delhi, shopping in India on April 14, 2012 by Deirdre Straughan. This wall of my bedroom is pretty much done, with a cheap-but-capacious dresser from Ikea, Elfquest prints, decorative bark balls bought on the street in Porto Alegre, and the etched mirror bought at Tribal Route during my recent visit to Mumbai. The merino sheep is from last summer’s trip to New Zealand, but he’d been stashed away til now because I was afraid my Colorado roommate’s dogs would think he was a toy for them and summarily dismember him (as they do with all their toys). And he’s way too cute for that dismal fate. Looking out into the living room, you can see the poster of Lakshmi that Yuti and I bought on the street in Mumbai. I had said to her: “I’d like to buy some god posters,” and we ran into an ambulatory poster vendor as soon as the words were out of my mouth. Yuti was amazed; there are plenty of street vendors in India, but she had not ever seen someone walking around selling posters until I apparently summoned him with the mere thought. The rubber tube “frame” came with the poster, the whole thing cost about $2.50. I could probably frame these in glass and sell them for hundreds of dollars each at a trendy shop in San Francisco. 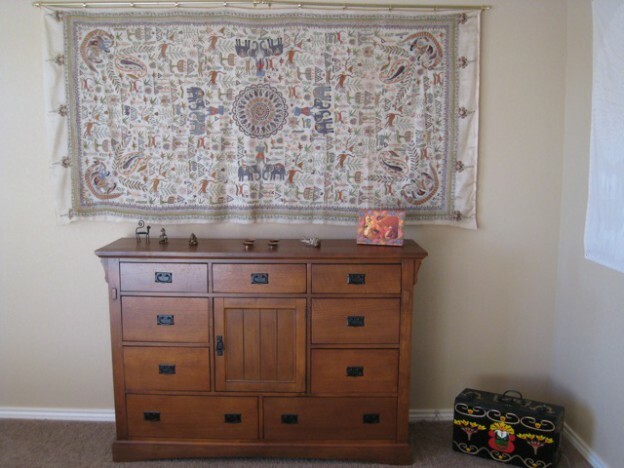 This entry was posted in bio and tagged decorating, San Francisco, shopping in India on April 20, 2010 by Deirdre Straughan. – it can take over an hour to get from one place to another, worse during evening rush hour, which begins around 3:30 and ends at 9 pm! The multiple concentric circles of Connaught Place, in the heart of New Delhi, are going increasingly upscale (at least in parts), perhaps in response to competition from all the shiny new malls further out. There are shops for Levi’s and Lee’s jeans, Van Heusen and other American brands, and even some Italian mid-level fashion brands. At the moment, it’s still possible to buy some very nice clothing at lower prices than you’d find in Europe or the US – though it’s also possible to spend just as much! Depending on the relative values of the rupee and the dollar, this advantage is probably destined to disappear. Connaught Place can be annoying, however. You can’t walk a yard without being accosted by touts: “Come look my shop”. For some reason the Kashmiri shop owners are the most aggressive; they manage to completely turn me off the mere idea of buying anything Kashmiri, no matter how lovely. Near Connaught Place you will also find the Central Cottage Industries Emporium, and the long row of state emporiums, which I observed in passing seem to have been upgraded in the last few years, but I didn’t get to them this trip. Full Circle Bookstore: A nice selection of coffee-table and other books on everything Indian, plus music, DVDs, and a nice coffee shop on the top floor. Fabindia: Shops on both sides of the square. Hand-woven, printed, etc. cottons and silks for home and wear. Fabindia also now has an interesting line of organic cosmetics and foods, including spices, grains, jams, chutneys, etc. Episode: Beautiful silver items for the home, including elegant modern Ganesh statuettes. “This Indian enterprise is an offshoot of a 30 year old family run business of rolling stainless steel.” It’s a fascinating synthesis: the design team, at least as presented on their website, is entirely foreign, but many of the products reflect Indian sensibilities as well as Indian uses and traditions. Beautiful stuff! I only knew Khan Market for Anokhi, the home of fine hand-printed cloth items. Anokhi has now split into two at that site, one on each corner of the block for home furnishings and clothing. Khan Market has some other interesting shops, including a Biotique, which I noticed because there was an autographed photo of Johnny Depp in the window thanking them for the almond kajal that he wore in “Pirates of the Caribbean.” So I went in and bought some, and it is indeed very nice kajal. This suburb which used to be a village is home to many multinationals as well as bedroom community for the city. 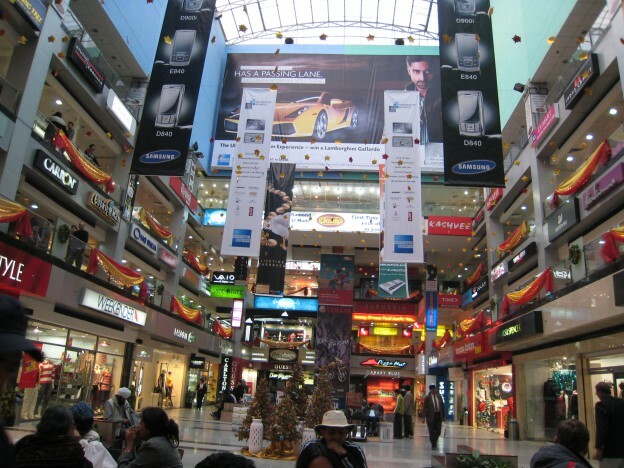 It now boasts a long row of shopping malls, some specialized in housewares or clothing, others a bit of a mix. As you can see in the photo above, many of the brands are familiar! 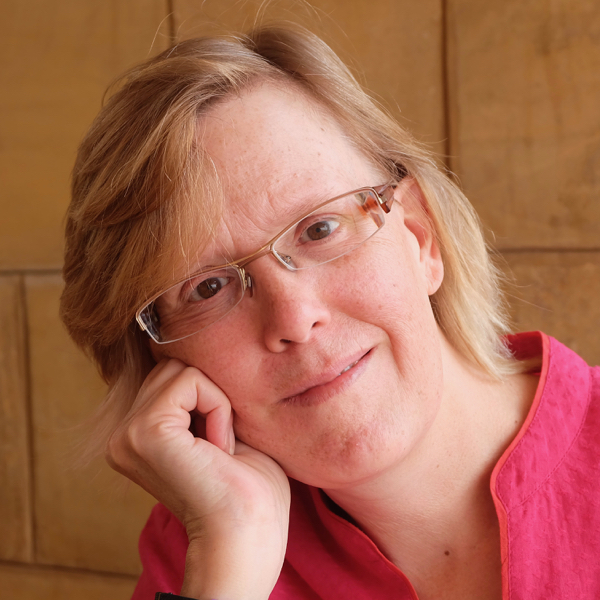 This entry was posted in India and tagged India, shopping in India, travel in India on December 23, 2007 by Deirdre Straughan.